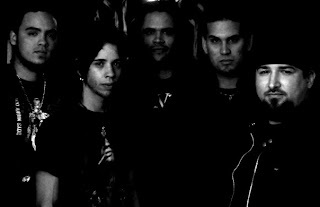 Puerto Rico's Alas Negras is a band that fully embraces the values of thrashy power metal put forth by bands like Iced Earth and Jag Panzer, adhering to the power of the twin-guitar riff and thunderous double-kick with reckless abandon. For their third album, with the October-appropriate title The Slasher Show, Alas Negras pays metallic homage to the season's favorite movie genre - complete with a couple of Vincent Price soundbites thrown in for good measure. The core of the band's sound is built around the twin-guitar riffing of Javier Diaz and J.C. Agosto, two axeslingers who both have a penchant for delivering some slick leads and interesting harmonies. The production quality on The Slasher Show is fairly primitive, lending a gritty old school sound to the riffs, but Agosto and Diaz nevertheless manage to impress with their abilities. While the early half of the album offers some nice variety, such as the melodic leads on "Never Sleep Again" and the proggy attitude to the riffs on "What Is Your Pleasure? ", the latter half of the album tends to stagnate. The guitar work doesn't lessen in quality by any means, but there's a definite lessening of innovation. Enhancing the twin-guitar core is the battery of bassist Carlos Maldonado and skinsman Bertito Roman, both of whom provide clear and memorable contributions to The Slasher Show. Maldonado's bass lines generally swirl just below the surface, almost like a shark circling its prey, but at times he stands front and center with a plucky run or two - such as on "Dead By Dawn". This song also features one of Roman's most complex performances, though he's in top form throughout the album. Rounding out Alas Negras is frontman Giancarlo Martínez, who possesses one of those inflamed voices so synonymous with the thrash of yesteryear. Though mostly a mid-range singer, Martínez occasionally ventures into the higher octaves when appropriate and does an admirable job of keeping it together. From time to time he also adopts a growl that skirts death metal territory, adding yet another dimension to the emotion and appeal that his style brings to the music. Although The Slasher Show is far from a polished diamond, it's an entertaining little gem that fans of thrashened power metal will certainly appreciate. The Vincent Price homage "Master Of Horror" along with the pleasingly intricate "Dead By Dawn" are just two highlights that make the album worth investigating. I recently bought the album and it was really awesome.